One of the key tenets of the draft inspection framework is that there is no preferred Ofsted Curriculum; there has been no preferred Ofsted pedagogy for years. Despite Ofsted repeating the above mantra; the question about the veracity of these two statements remains. A fairly unreliable twitter poll, with 624 responses conducted last weekend, confirms the increasing lack of confidence in Ofsted’s statement; simply repeating something “Ofsted has no preferred curriculum” or “strong and stable leadership” doesn’t makes it true or believable. With 39% of respondents voting that the EBacc is Ofsted’s preferred curriculum; the inspectorate may wish to stop its convoluted efforts to tell everyone it doesn’t have a preferred curriculum or that the EBacc isn’t a curriculum. The EBacc fits one of a number of reasonable definitions of a curriculum. Section 162 of the draft inspection framework confirms this. It also contains the “great colon” (referring to a grammatical rather than anatomical feature). By way of background, Richard Rohr, commenting on the Apostles’ Creed, invited readers to ask some serious questions about a single comma, termed the great comma; “born of the Virgin Mary, suffered under Pontius Pilate”. Ofsted’s great colon also reveals a yawning gap. It requires us to ask some serious questions; not least where all the modern foreign language teachers and increasingly the Science, Maths, History, Geography, Computing Science and English teachers are to deliver the EBacc, equitably across all schools. Schools in disadvantaged areas, on average find it harder to recruit and retain teachers of EBacc subjects. They are doubly disadvantaged by this proposed framework. It requires us to challenge the inspectorate’s limited and simplistic connection between “the heart of an effective key stage 4 curriculum is a strong academic core” and the EBacc, which is merely one example of an academic core curriculum. There are many other perfectly reasonable examples of a core academic curriculum; they differ in terms of the number of subjects that constitute the core and which subjects they contained but are no less valid or appropriate for pupils. Interestingly or ironically, the above from the judgment criteria for a good school sees our independent inspectorate leaning on and towards the Department for Education. If a new government or the current government’s policy changes it could be an interesting. Anyone for 21st Century skills in a few years time? 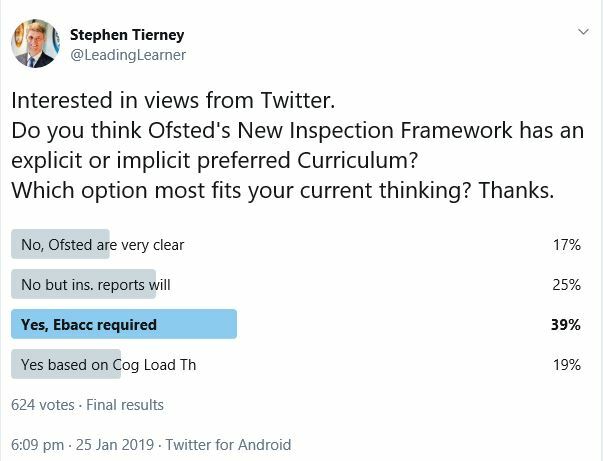 In the twitter poll, I deliberately asked whether Ofsted’s new framework had an explicit or an implicit preferred curriculum. The implicit element refers to the research that underpinned the framework; central to it was the definition of learning linked to changes in long term memory and Sweller’s work on Cognitive Load Theory. What is critical to understand is, “Cognitive load theory was introduced in the 1980s as an instructional design theory…” Once you place cognitive load theory at the heart of the evidence base upon which you draw there are significant implications for the pedagogy; explicit instruction and the associated tasks used to promote learning. I believe Ofsted has a preferred curriculum and a preferred pedagogy; there needs to be much greater honesty about this and the reasons why. That will help people discern and debate whether Ofsted’s preferences are substantiated by evidence or personal whims. As an alternative explanation, I may just be deluded and it’s time to put me out to grass. Of course, there is always the possibility the whole area of curriculum is hugely contentious and depending upon which research you include in your evidence base and personal experiences you end up with very different beliefs. The profession is effectively “sleep walking” into the new framework; many schools will be ill-prepared for the curriculum debate. Equally, I can see inspectors repeatedly asking schools for their curriculum “intent, implementation and impact” with nothing more than a few training slides and a wing and a prayer understanding of what they are asking and the response being given. I think people need to debate the above issues widely and over time. The Chartered College of Teaching is one organisation that could productively take that debate forward. I’ll give my two pennies worth from the periphery of that particular debate as the debate, I think should take precedence, is how can we best deliver important curriculum change? Is there a different means other than hyper-accountability – with far fewer negative side effects relating to excessive unnecessary workload, the associated attrition of teachers and leaders and unethical practices/gaming – we could use to help schools improve? A focus on the curriculum supported by high quality, subject specific professional development and learning is arguably a much better bet. It’s interesting to note the difference between how the Early Career Framework and the New Inspection Frameworks have been received. Is there something in that particularly given the overlap in content but radically different implications for how schools will be engaged? School leaders and teachers always prefer to do with rather than being done to; it’s time for radical change before we’re all done in.